Lena Andersson is a well-known newspaper columnist, social commentator, and novelist in Sweden. Willful Disregard, her fifth novel and winner of Sweden’s highest literary honor, the August Prize, is her first book to be published in the U.S., and it is an impressive introduction to a writer with keen insight into love in both its universal characteristics and its modern trappings. Andersson probes the mind of thirty-one-year-old journalist Ester Nilsson, who becomes infatuated with artist Hugo Rask when she is asked to write an in-depth profile of the semi-legendary older man. From their first interview, they seem to be intellectual kindred spirits, and Ester is entranced. Over the following weeks they meet for meals or drinks and their long conversations about art, philosophy, and culture continue. Ester is smitten and believes Rask returns at least some of her affection despite the relationship’s platonic nature. It appears he is involved with another woman, at least in some fashion. Ester is so enamored of Rask and so convinced that her future lies with him that she leaves her long-term boyfriend. Undoubtedly, Ester reasons, Rask is disengaging from his other commitment as well. Ester hangs on Rask’s every word, gesture, and action, obsessively analyzing each for its true meaning with regard to his feelings and their burgeoning relationship. She squeezes impossibly rose-colored interpretations out of the most minor of words and deeds. Andersson proceeds to probe Ester’s thoughts and emotions with laser-like intensity. The ruthlessly unsentimental narrator sees through Ester’s pretensions and rationalizations into her true motives, flawed thinking, and overwhelming need to “only connect.” In doing so, Andersson has written one of the most accurate explorations of the self-deception and madness of new love that I have ever encountered. In that sense, it reminds me of Scott Spencer’s brilliant Endless Love (although her prose style is tersely analytical where his is richly nuanced and Romantic). In fact, if there is a writer Andersson puts me in mind of, it is Elena Ferrante. As with the Italian novelist behind The Neapolitan Quartet that begins with My Brilliant Friend, the writing is distinguished by a fierce and unrelenting psychological dissection of every character and relationship. But Andersson also displays a sharp wit and the ability to find the bittersweet humor in most situations. I can’t recall the last book in which I was tempted to highlight so many pithy lines of description and explanation. At one point, Ester awaits Hugo’s call, which is not forthcoming. “She had to occupy herself with something while waiting for her life to start. She looked at the phone. Perhaps she had it on silent by mistake? No. No one had called, and no text message had arrived unnoticed. She rang herself from her landline to check her mobile was working. Sent herself a text. Everything worked as it should.” Later that day, the narrator notes, “It was three o’clock and he had not called. She had coffee in a cafe and an extra-large pastry with it, on account of the situation.” Both observations are bitterly true, full of pathos, and from a distance, undeniably funny. Is it so strange that “[S]he chewed endlessly over what had happened, with herself and with anyone who would listen, going through what she could have done differently at such-and-such a time or on such-and-such an occasion, if only she had known things would turn out as they had”? A brief encounter with Rask months later rekindles her not quite extinguished hope. She decides to call him. “She was ringing because the itch was back, the malarial love itch that is always latent once it has invaded the cell system, lying ready to break out at any time.” This is exactly right. We have all been there, male and female alike. While Ester Nilsson is uniquely flawed and misguided in love, she is often Everywoman, at least as far as I can tell from observation and experience. 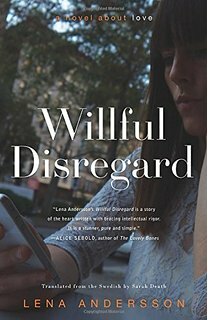 I suspect that most readers will experience conflicting emotions when they read Willful Disregard. They will think, This woman is crazy. She is nothing like me! I would never do that! Mere pages later they will think, Oh my God, I’ve done that! That is so true. What was I thinking? Definitely sounds like an intriguing read. Will have to check it out in the near future. Interesting review.. May well look at his one.